Magdalena Island – about 70,000 Magellanic Penguins nest on this island about 20 miles north of Punta Arenas. The penguins arrive in September to have their young and they leave in March. Zodiac tours access the island, but seas can be quite rough at times. Visitors get to spend about an hour on the island. 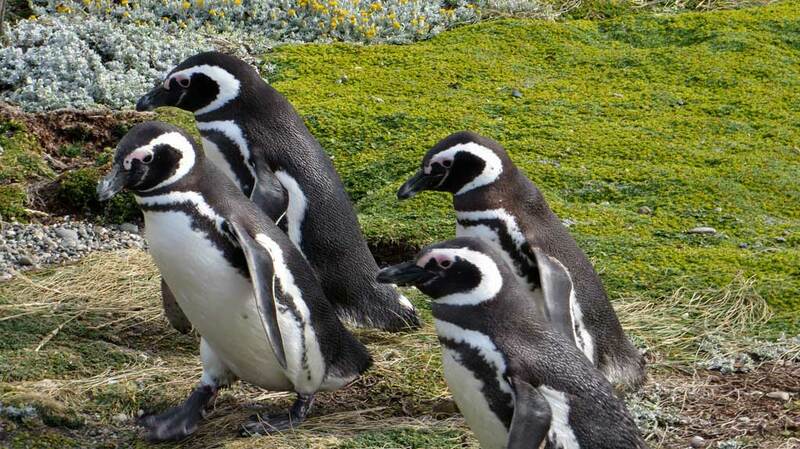 Otway Penguin Colony – about 100 Magellanic Penguins nest an hour from Punta Arenas. 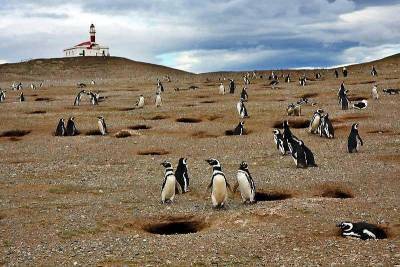 Similar to Magdalena Island, the penguins arrive in September and leave in March. 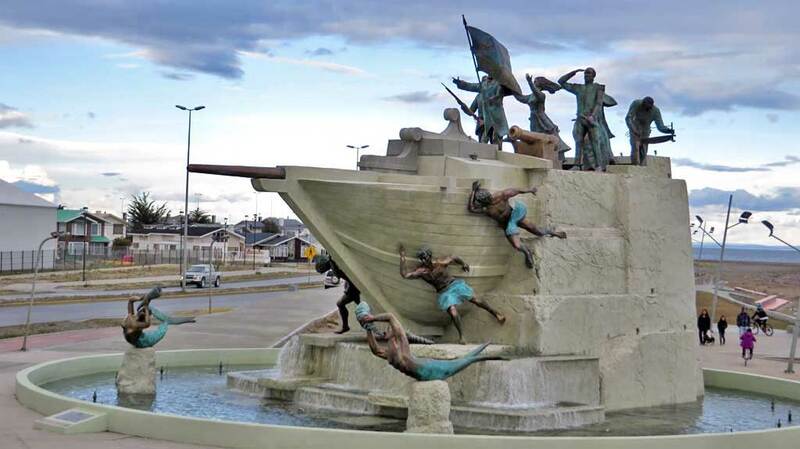 The main plaza downtown, Munoz Gomero, has a monument to Magellan at its center and supports many araucaria trees. The Cathedral, city hall, the Sarah Braun Museum and the Magallanes Regional Museum all border the plaza. Head 4 blocks west of the square, up the hillside to Cerro Mirrador la Cruz viewpoint. The Maggiorino Borgatello Museum is about 6 blocks east of the main plaza. The museum was founded by the Salesiano missionaries and provides natural history information about the indigenous people. It is closed on Mondays. 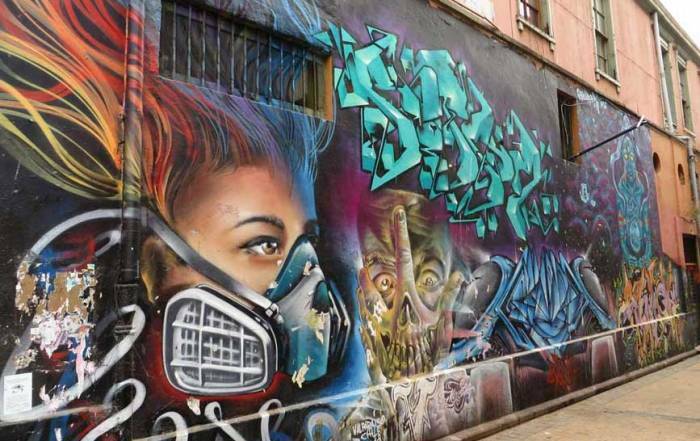 It’s a short walk from the square to the Hotel Dreams Del Estrecho and Casino on the waterfront. Take a look at the cormorants on the docks along the shore. Their black backs and white chests easily convince tourists that these are penguins, but they are actually birds. 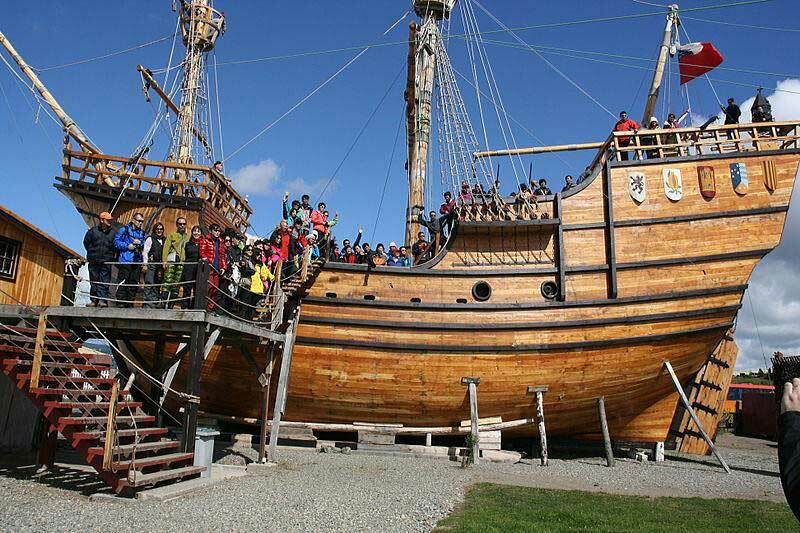 Head north along the waterfront a few minutes to reach the waterfront sculpture of the settlement of Punta Arenas by the arrival of the Tripulantes Goleta Ancud. Between the cruise ship terminal and the downtown is the Naval Maritime Museum. There are details of Chile’s attempt to rescue the Shackleton Expedition. The naval museum is closed on Sundays and Mondays. 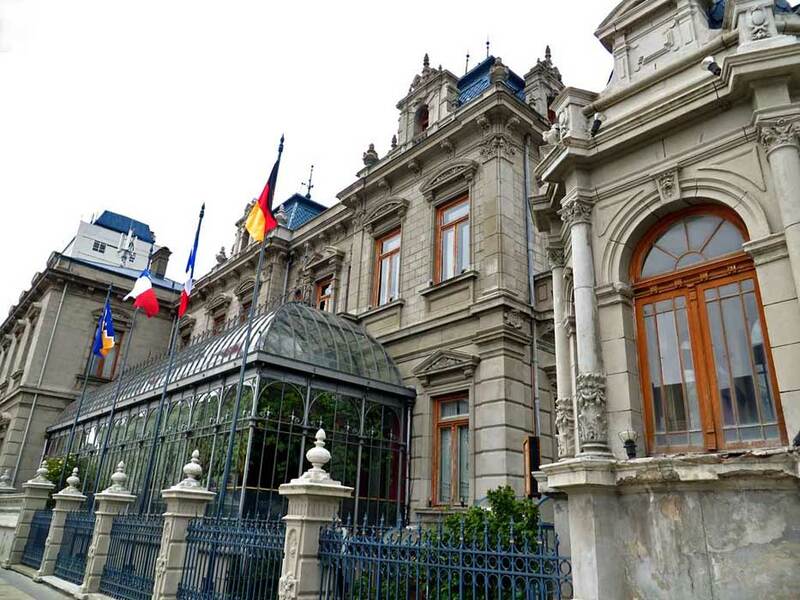 Museo deal Recuerdo is open weekdays. It’s an open air museum of European trains and machinery located about 2.5 miles from downtown. Take a 10 minute cab ride to the Nao Victoria Museum, which has a replica of the ship that Magellan sailed through the Straits of Magellan. 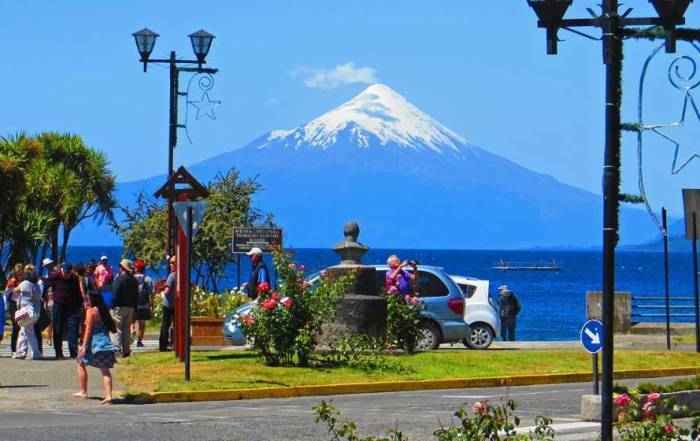 For views of the city, the Straits of Magellan and Tierra del Fuego, head 15 minutes out of town to the Cerro Mirador Ski Resort. Club Andino includes a 5,000 foot chairlift. Recreate an episode of the Amazing Race and try to find the Lord Lonsdale (Barco Viejo) shipwreck several miles out of town. Travel an hour south to the historic Fort (Fuerte) Bulnes. 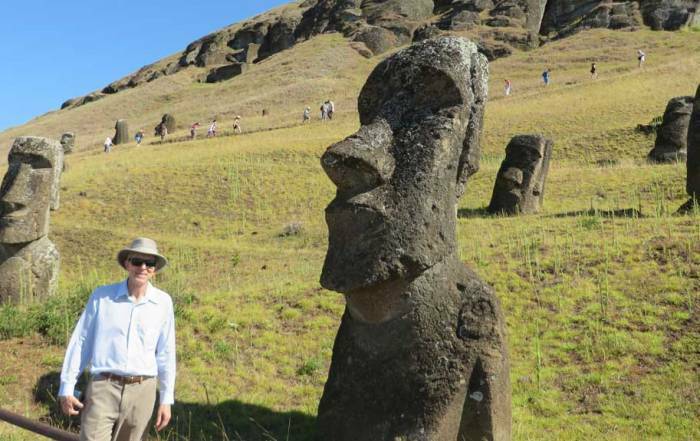 Travel 3.5 hours northeast to volcanic Pali-Aike National Park and the Pali Aike Crater. 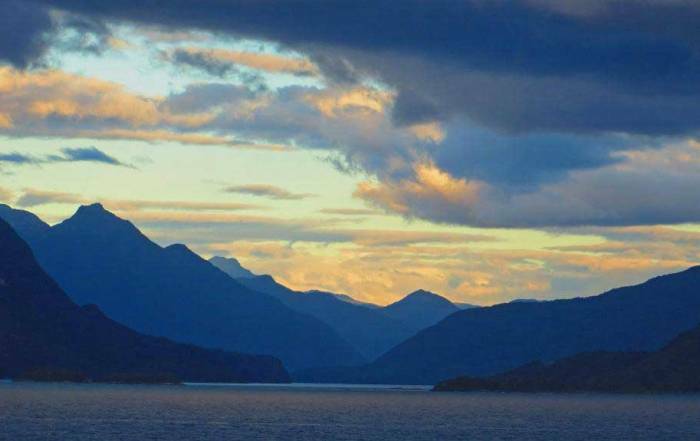 Take a cruise with Australis Patagonia Cruises from Punta Arenas to Ushuaia. Weather in the winter (July) is moderated by the Straits of Magellan. Average winters highs are about 40 F (4 C) while winter lows average a couple of degrees above freezing. In the summer (January) tourist season, average highs are less than 60 F (15 C) and the lows average about 40 F (6 C). Those who expect to find warm summer weather in Punta Arenas will be consistently disappointed. Presidente Carlos Ibanez del Campo International Airport (PUQ) is located about a half hour north of Punta Arenas. Major local bus lines link the city with Puerto Natales in Chile and Ushuaia in Argentina. 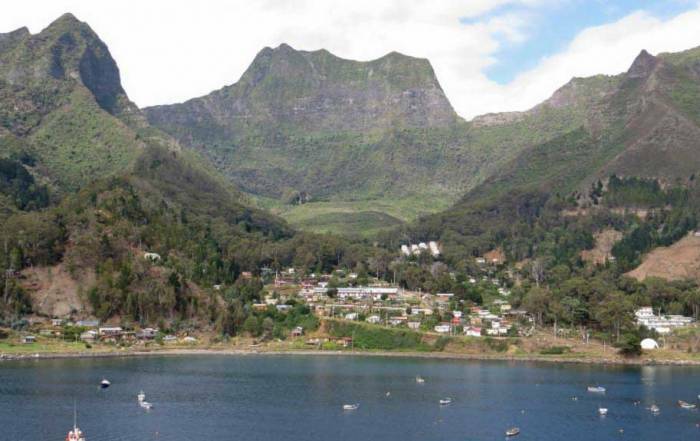 Most cruises around the tip of South America make a port of call at Punta Arenas. Hotel Dreams Del Estrecho – at the casino on the waterfront. Punta Arenas (Sandy Point) was founded in the mid 1800s as a penal colony and as a means of establishing Chilean sovereignty in the region. Since that time, many European immigrants have settled here. Today the city is just over 100,000 in habitants and its main economic base is sheep ranches, a small petroleum industry and tourism. 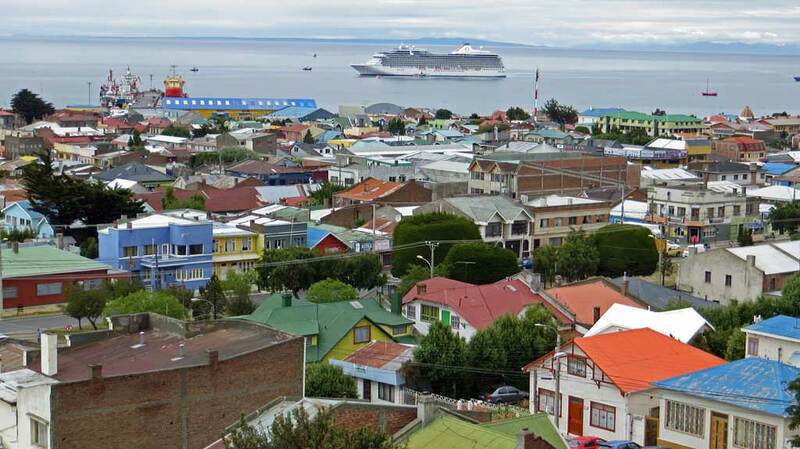 Punta Arenas has become a standard stop for cruise ships traversing the tip of South America between Buenos Aires, Argentina and Valparaiso, Chile. Don’t confuse Punta Arenas, Chile with Puntarenas, Costa Rica, which is also a common cruise ship port of call.